PHOENIX — Arizona will be represented when the 2017 National Archery in the Schools Program (NASP) World Tournament gets underway this weekend at the Orange County Convention Center in Orlando, Fla.
Caitlin McDermitt, a ninth-grader and member of Phoenix HEAT (Home Educated Archery Team), will compete in the bullseye and the IBO (International Bowhunting Organization) 3D Challenge. 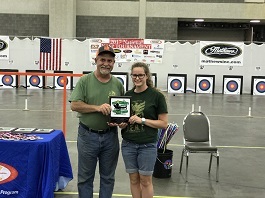 McDermitt qualified for the world tournament after a strong showing at the national event May 11-13 in Louisville, Ky., where she finished 14th in the bullseye and fourth in the 3D competition. She also was fourth in the Centershot Ministries (archery in the church) event. The Arizona Game and Fish Department coordinates NASP on the state level and hosts a half-dozen state qualifying tournaments throughout the academic year, beginning in September and ending in March. The top three boys and girls competing in the bullseye and 3D events in three divisions – elementary, middle and high school – are awarded. The program is a physical education curriculum designed to teach international-style target archery for students in grades four through 12. The core content covers safety, techniques, equipment, mental concentration and self-improvement, as well as the history of the sport. Arizona’s NASP program is funded through an excise tax on the sale of hunting and shooting sports equipment. No state general funds are used to support the program. Game and Fish administers the program for the purpose of promoting safe, responsible aspects of the sport, as well as wildlife conservation as part of the Wildlife and Sport Fish Restoration Act (WSFR). Visit www.azgfd.gov/archery for more information.